Driving or riding in a motor vehicle is likely the most dangerous activity the average person performs on a regular basis. All personal injury cases have the potential to be complicated and injuries resulting from motor vehicle accidents are no exception. 1. Should you settle or take your case to court? Of course, this will depend on the details and the economics of the situation. 2. Can you meet burden of proof? In a nutshell, it must be shown that your allegations are true or likely to be true. The type of case determines the standard of proof that must be met. You will need an injury attorney to help you make distinctions on this. Most motor vehicle cases are based upon a claim of negligence. The four elements of negligence are Duty of Care, Breach of Duty, Causation, and Injury and Damage. Duty of Care: It must be shown that the defendant was responsible for showing care and caution for the plaintiff’s safety. All drivers obviously fall under the responsibility in general, but the unique situation must also be considered. Breach of Duty: Did the defendant fail to meet his or her duty of care? In general terms, was the person less careful than a reasonable person would be under similar circumstances? Causation: It is also necessary to show that the breach of duty was responsible for the accident that caused the injury. Injury and Damages: The details and the extent of the injuries must be shown. This is commonly accomplished through testimony of medical experts, photographic evidence, and medical records. Can the damages being sought be justified by the injuries? Bus accidents are unique in many ways. Many buses, particularly school buses do not have seatbelts. Buses are also commonly owned by corporations, schools, and city governments. Depending on ownership circumstances, the strategy for presenting the case may be altered. 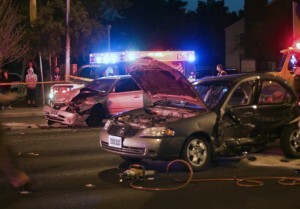 Car accidents are quite common are a major cause of injury and wrongful death in the United States. Nearly everyone is involved in an automobile accident at some point in his or her lifetime. Be sure to contact the police after any accident and hire a personal injury attorney; statistics show that the odds of receiving a fair settlement are improved. Hire an attorney BEFORE filing your accident claim. Hit and run accidents are complicated by the fact that the police must locate the other party in order to receive restitution from the other party or the insurance company. Fortunately, uninsured/underinsured motorist coverage will frequently cover this situation. Personal injury protection coverage is a type of optional insurance that can also provide compensation in these situations. Just because you are dealing with your own insurance company doesn’t mean you’re absolved of the need for an attorney. All insurance companies make an effort to pay as little as possible. Motorcycle accidents can be particularly devastating. The lack of a restraint system and the disparity in size between a motorcycle and most other vehicles on the road can result in substantial injury. Every year there are over 90,000 motorcycle accidents resulting in injury and approximately 5,000 deaths. Motorcycle and scooter riders are protected under the law to the same degree as automobile and truck drivers. However, many judges and juries are prejudicial when dealing with motorcycle accidents. Pedestrian accidents are far more common than most people realize. Roughly 5,000 pedestrians are killed each year from being struck by a motor vehicle. Another 78,000 are injured each year. Additionally, several thousand pedestrians are injured from parking lot and sidewalk defects, construction, and debris. School bus accidents are unique in that a school system, private or public, is involved. The city and state can also be involved. The lack of restraints on most school buses creates a greater likelihood of injury. Serious injuries to young children can also have greater long-term consequences, which must be considered in any school bus related personal injury case. Tractor-trailer accidents typically involve commercial enterprises, though some trucks and trailers are individually owned. Cargo can include harmful chemicals that have unpredictable long-term health effects. The drivers of these trucks are also frequently sleep deprived due to the demands of the job, and it may be possible to include the shipping company in the lawsuit. Truck accidents are similar to car accidents, but most trucks are larger and sit higher off the ground. In many cases, the driver of the truck fares better than the driver of a car. Is the truck being used for commercial purposes? It can make a difference. Vans, particularly work vans, can have reduced visibility. This makes accidents more likely. Many vans are used for commercial purposes, and this fact can influence the nature of the case. All personal injury cases involving motor vehicles can be complicated by numerous factors, most of which can have an impact on the ability to receive fair compensation. Get the expert assistance to ensure the best possible outcome. If you need a truck accident lawyer or car wreck lawyer in Louisville, Kentucky or any city in Kentucky I can represent you in your case. Call me now to discuss the particulars of your situation any time day or night I’m here to help!